Did I just hear an audible groan from the other side of the screen? I know, I know…the idea of planning your families wardrobe right after you’ve had a baby can seem daunting, but it doesn’t have to be! 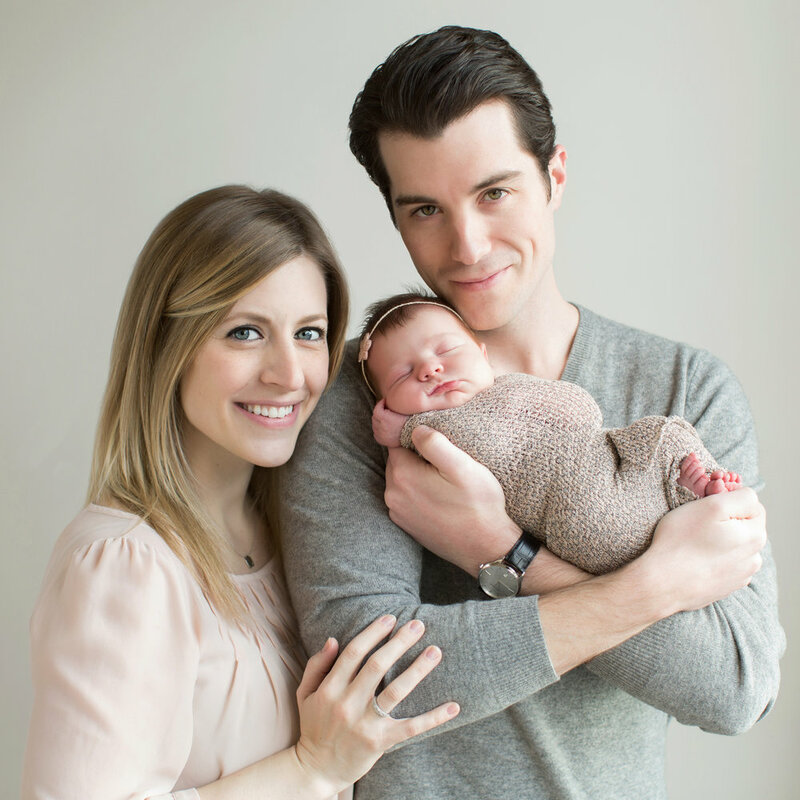 Here are some tips for putting together the perfect look for your newborn session. Newborns should be that star of the show during our session together, so try to avoid any loud or distracting colors and patterns. Sticking to 2-3 colors that compliment each other well works best (think soft pinks and blues, greys, creams and beiges). We LOVE neutrals here at MDP, and our studio compliments them well. By keeping the palette simple, the focus will stay on the newest (and smallest) member of your family. The truth is, we won’t see that much of your outfit in the photos because the star of the session is soooooooo small! That being said, it’s most important to choose a top that you feel good in, aka…like yourself. Start by considering what kind of neckline is most flattering, then look through the colors that fit the palette and hopefully you’ll land on something that will look AND feel great. Being in front of the camera can make anyone feel vulnerable. Especially new moms. This last tip is really just a leap of faith….to trust that we’ve got your back. If we see an unsightly bulge, we’ll hide it. A double chin? We’ll adjust our angle. The bottom line is, you can trust that we will see it all and make absolutely sure that you will look like the glowing new mama you feel like inside. As for the baby, the only thing you need to worry about is bringing them to the studio in something that’s easy to get off. We recommend a zip or button down onesie that won’t wake them up if they come in sleeping. We have a plethora of newborn swaddles, headbands, pants, hats, you name it! No matter what you’re wearing, we’ll have the perfect accompaniment for your newborn.